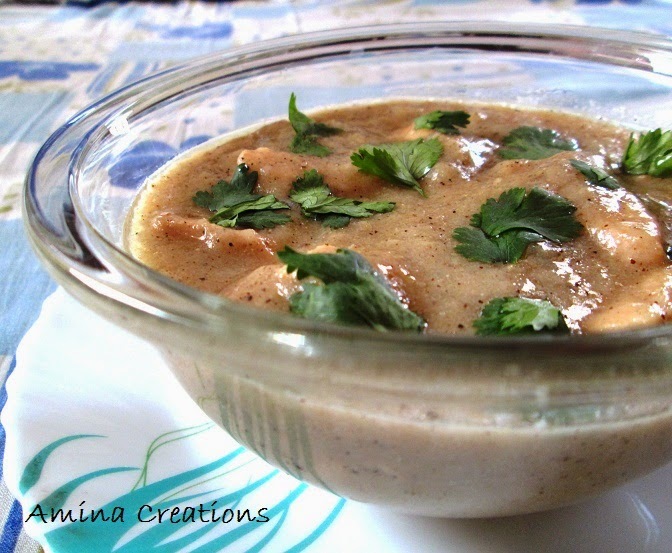 Curd and pepper chicken gravy is delicious gravy made using chicken marinated in curd and seasoned with pepper. The recipe is straight from my mother's recipe book and is very easy to make. Marinate chicken along with curd and salt for about half an hour. Heat oil in a pan, add onions and sauté till the onions turn soft. Break open a cardamom and add the seeds to it. Add chicken curd mix and mix well. Add pepper powder and ½ cup water and bring to a boil. Reduce heat and cook covered for about 15 minutes till the chicken is cooked. Keep stirring in between and add more water if necessary. When the chicken is cooked, add green chilli and cornflour dissolved in 2 tbsp water and bring to a boil. Cook for a couple of minutes and check for taste. Add salt or pepper if necessary and mix well.